Details of Pagani’s exclusive Vanishing Point tour prove elusive. Also, a round up of France news: the mystery of Les Lacets du Montvernier; government to appeal Paris A1 bus and taxi lane suspension; a taxi strike threatens to paralyse major cities next week; and, coach operators consider scrapping booze cruises due to the Calais migrant crisis. A Pagani Huayra nicknamed Buttercup was a high profile participant in last weekend’s ‘Vanishing Point 2015’ tour. Described as ‘one of the most exclusive automotive events held anywhere in the world’, restricted to Pagani owners and named after the 1971 hot pursuit film, the event is now in its eleventh year. One man apparently shipped his one-off Huayra Mona Lisa over from Singapore especially. So exclusive is Vanishing Point in fact that details of the actual route are impossible to find. All we know is that it kicked off last Thursday night with a dinner at the maker’s brand new factory in San Cesario sul Panaro near Modena. When it opens in September the new facility will be capable of producing 300 vehicles each year. Production will be capped at 45 cars initially however to maintain the all-important exclusivity. The initial run is all said to be the new Huayra Roadster due to be unveiled at next March’s Geneva Motor Show. Vanishing Point finished with a Pagani-only parade at Parco Valentino in Turin on Sunday, an open air show enjoying a new lease of life after being first established in 1900. Direct, the distance from Modena to Turin is just 310km across the south of Milan through Piedmont and the Ligurian Apennines, some of the ground covered on Lamborghini’s 2013 Grand Tour. Bobbio, 75km north east of Genoa, in the Trebbia River Valley – described by Hemingway as ‘the most beautiful in the word’ – is said to be one of Italy’s finest villages. Few drivers seem to tackle the D77b Les Lacets du Montvernier (we can’t blame them it looks absolutely horrific). There’s only one video on YouTube, albeit a good one. Cyclists seem to enjoy it however. It was a feature climb on the Criterium du Dauphine bike race at the weekend and this year, for the first time, it will be included in the Tour de France. 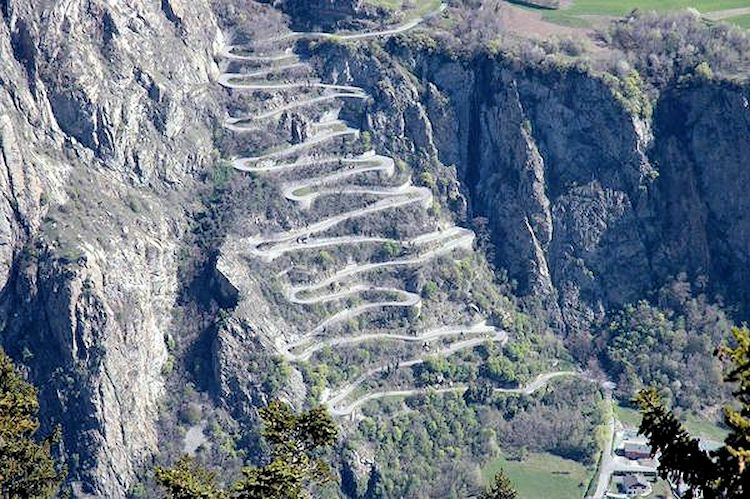 Built in 1934, it rises in seventeen hairpins – lacets means hairpins – over 2.5km between the A43 and the tiny village of Montvernier at the top, less than 10km north of Saint Jeanne de Maurienne in the French Alps. roundup FRANCE. PARIS. Unsurprisingly, the French government will appeal the recent ruling suspending the new A1 Paris bus and taxi lane it said today. The reserved lane southbound between Roissy/Charles de Gaulle and the peripherique ring road opened in April, initially for a period of three years. It is barred to all other vehicles between 06:30-10:00 during the week but was struck down earlier this month after a complaint by the VTC chauffeur’s association. Another new bus and taxi lane, on the A6a northbound into Paris, remains in operation. TAXI STRIKE. The statement also updated taxi drivers on various legal procedures around the country – 420 in total – against the controversial Uber operation, a day after taxi unions threaten to ‘paralyse’ major cities next Thursday (25 June), particularly Paris, Marseilles and Lyon (update from rFI English: the drivers plan an ‘unlimited’ sit-in outside major airports and railway stations). CALAIS MIGRANT CRISIS. Coach firms consider scrapping ‘booze cruises’ says the Daily Express due to the risk of migrants secreting themselves inside vehicles during stops at hypermarkets near the Channel. It comes two days after a YouTube video emerged of a coach full of passengers witnessed gangs of migrants trying to break into trucks while waiting at Calais during last month’s bomb disposal. Commercial vehicles have so bar borne the brunt of the problems at Calais but regular vehicles, particularly motorhomes, are at risk too. The Foreign Office advice is to ‘keep vehicle doors locked in slow moving traffic and secure your vehicle when it is left unattended’.